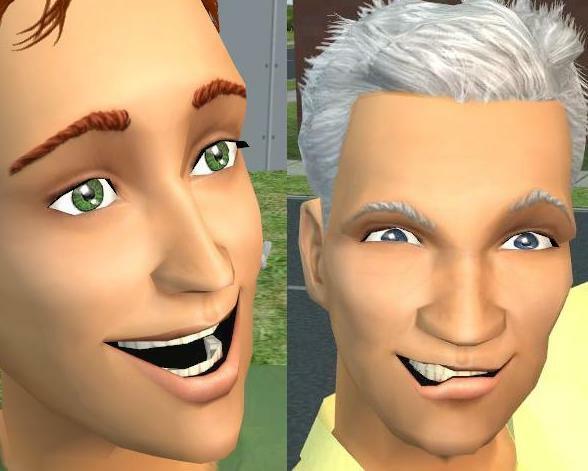 - as sims age, their features grow more defined, less baby fat, sharper noses, deeper eyes, etc. This package includes faces for light, tan, medium and dark skins. You MUST have HystericalParoxysm's "Barbie version" Idolatry of Flesh DEFAULT REPLACEMENT skins (light, tan, medium, dark) in order to use these faces. 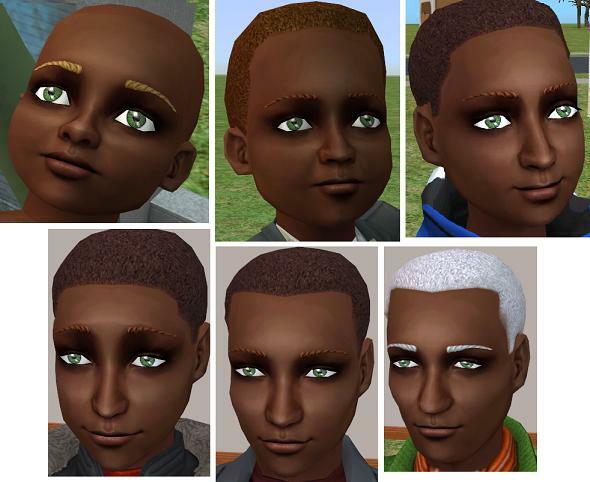 The faces will NOT work with AC (anatomically correct) versions of HP's skintones (Aelflaed discovered this, thanks). The AC version file available here, 18+ only. 3) Replace HP's file you just removed with my file, the one you download from here. 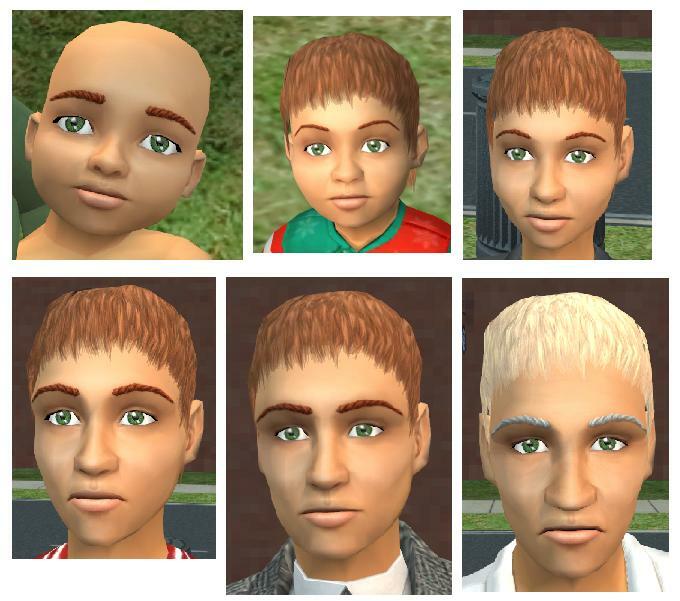 In the above image, you can see a light skinned sim losing his baby fat and gaining feature definition and eventually very, very subtle wrinkles as he ages. 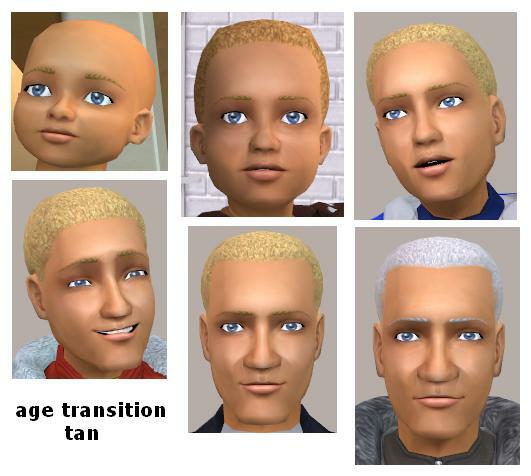 To see age transition faces for tan, medium,and dark skintones, please click the appropriate thumbnail pictures. There should also be an image with teeth, so you see Alkaloid's teeth with my better mesh fit change. Above, you can see what the rest of the skin below the neck (HystericalParoxysm's work) looks like, but she has a much more beautiful picture on her Idolatry of Flesh page. More skin shades in thumbnails. 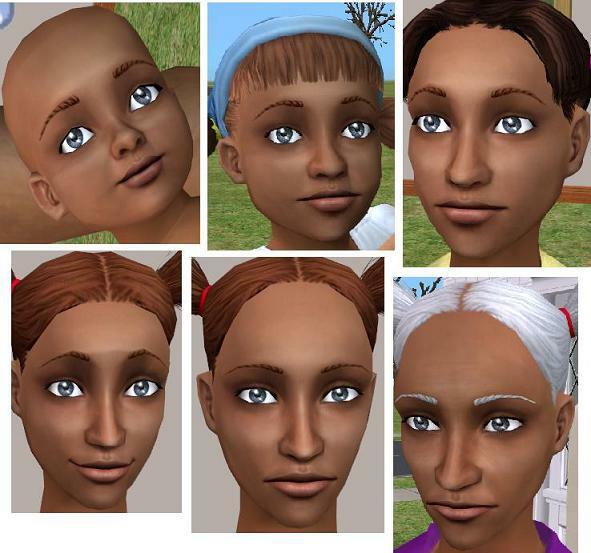 For your darker skinned teenage, adult and elder sims, I suggest my flatter nose blush unless their noses are actually pointy. For your Asian sims, I suggest my Asian eyelid blush. If you've been using my subtle eye blush, you can take it off because these skins incorporate it already. Finally, if you use Phaenoh's Keen Eye eyes and have dark skinned sims, I suggest my darker sclera blush. You may upload and/or modify my textures (but the package file was originally HystericalParoxysm's). Do NOT upload to pay sites. Please link here and give me credit, and also link to HP because the skin is hers, I just changed the faces. To HystericalParoxysm, Alkaloid (and Phaenoh) for allowing me to use and modify their textures. The red hair in the top image is HystericalParoxysm's New Roman hair. Keen Eye eyes by Phaenoh.